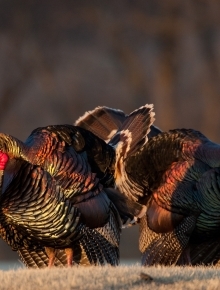 Often referred to as the thunder-of-the-woods, the wild turkey truly earns its nickname during spring. If there’s one thing turkey hunters love more than the piercing gobbles from a mature long-beard in response to a call, it’s the strutting show these creatures put on when they are fired up in the presence of a hen. Turkeys’ behavior reveals much about how they will react under particular circumstances and scenarios. This behavior is also what makes pursuing them addicting. From the changing of colors in their head and neck, to the spitting and drumming of a bird in full strut, gobblers produce enough excitement in their approach to keep hunters on the edge of their seats. It’s a scene that can be enjoyed in many locales across the Lone Star State. Just as sure as wildflowers are blooming and song birds are singing, wild turkeys are putting on their Sunday best as they traverse a variety of terrains in search of a mate. Collective efforts from landowners and agencies across Texas ensure that hunters continue to enjoy adrenaline rushes in the field for many springs to come. According to Texas Parks and Wildlife Department (TPWD) biologists, turkeys are native to the Americas and likely evolved from pheasant-like ancestors. Native Americans ate turkeys and used their feathers to adorn themselves and their weapons. Turkeys were nearly extirpated from Texas by the late 19th century. As a result, protective efforts outlawing trapping for a five-month portion of the year were initiated. In 1903, a bag limit of 25 turkeys per day throughout a five-month season was established. The liberal nature of these regulations combined with the lack of enforcement did not bode well for turkey populations across much of the state. In 1919, the legislature created a bag limit of three bearded gobblers per season. Increased protection from conservation-minded landowners and additional game wardens during the 1920s helped turkey populations recover throughout the majority of the state. TPWD has trapped over 30,000 Rio Grande turkeys since the 1920s and restocked them in ideal habitats across the state in an effort to restore the bird to its historic range. TPWD has also partnered with the National Wild Turkey Federation (NWTF) and other state agencies to revive eastern turkey populations in East Texas. These restocking efforts involve birds that were trapped in other states and released in East Texas over the past few decades. The Eastern turkey was at one time prevalent in East Texas. Rapid changes in habitat combined with unregulated harvest caused the Eastern turkey to be extirpated from the state around the turn of the 20th century. The first restoration efforts for eastern turkey utilized pen-raised birds and later the Rio Grande subspecies. These methods failed to create a sustainable turkey population. According to the TPWD Turkey Program Leader Jason Hardin, TPWD initially began releasing wild trapped Eastern turkeys from neighboring states in 1979. By 2003, more than 7,000 wild turkeys had been stocked into East Texas utilizing a block stocking approach. In 2007, TPWD funded research through Stephen F. Austin University to test a “super stocking” model for restoring turkey populations. After a few years of research, this strategy has shown considerable merit. In 2014, TPWD reopened the Eastern Turkey Restoration Program. Hardin says the preferred vegetation scheme on a given property should be composed of no more than 50 percent open habitat, and no less than 7.5 percent open habitat. There are several requirements for properties to become part of the Eastern Turkey Restoration Program. TPWD is currently focusing on two priority areas: the Sulphur River Priority Area and the Neches River Priority Area. The Sulphur River Priority Area encompasses Sulphur River, White Oak Creek, and Cypress Creek watersheds within Bowie, Camp, Cass, Delta, Franklin, Hopkins, Morris, Red River, Titus and Upshur counties. The Neches River Priority Area includes the Neches River and White Rock Creek watersheds within Anderson, Angelina, Cherokee, Houston, Jasper, Polk, Trinity and Tyler counties. Other counties within TPWD Wildlife Division Region III of East Texas may also qualify, but will not be given priority over the landscapes described above. Restoration sites must consist of a minimum of 10,000 acres of contiguous usable habitat. Proposed restoration sites may consist of multiple landowners as long as the landowners demonstrate a level of cooperation. A request for restoration on a given property must be submitted by the landowner or their agent, and this individual must have management authority of the property. Individuals must make a written restoration request to TPWD’s Upland Game Bird Program (Jason Hardin at Jason.hardin@tpwd.texas.gov or by mail to P.O. Box 279, Buffalo, TX 75831). Owners of proposed restoration sites must meet with TPWD staff before TPWD can move forward with the evaluation process. Prior to a stocking, release sites must also possess a TPWD-approved Management Plan and demonstrate management activities beneficial to wild turkeys. One of the largest habitat issues in the South Texas region for Rio Grande turkey has been the loss of significant roosting sites. Oak and -hackberry trees provide the main source of roost habitat for turkey in the region. Over the years many of these trees fell succumbed to drought destroying much of the roosting habitat. Recent studies have shown that Rio Grande turkeys are able to adapt and will readily use artificial or constructed roosts. There is currently a team of professors at Texas A&M University-Kingsville working with a graduate student on a project that is examining the success of artificial roosts in South Texas. The team of professors includes Dr. William Kuvlesky, Dr. Lenny Brennan, Dr. Humberto Perotto and Dr. Pancho Ortega. The graduate student they are working with on this project is Brandon Mitchell. The project includes a collective and cooperative effort from private landowners and a non-profit organization called Las Huellas. These key players are also providing the funding for the project. The project involves eight ranches that are using 60 constructed or artificial roosts to enhance turkey habitat. Mitchell’s focus has been on constructed roost dimensions and composition. He has found an artificial roost must possess a large stable platform and the ability to accommodate many turkeys in order for the structure to attract consistent use.. The idea for this project came about around 10 years ago when Kuvlesky was he was driving along a highway at the edge of a South Texas ranch he was conducting some research on. The El Veleno Ranch in Zapata County owned by Renata Ramirez joined the project about three years ago. Kuvlesky states that at the time the roosts were placed on El Veleno Ranch, Ramirez was only seeing a hen or two traveling the property on occasion. Another landowner that has supported the project is Charlie Hoffman, owner of the HC 30 Ranch in Duval County. Turkey numbers on the HC 30 Ranch have also increased significantly in a short period of time since artificial roosts were constructed on the property. The next step in the project is using satellite imagery to examine what vegetation and landscape features turkeys prefer around the artificial roosts on a large scale. The team is hoping to find another graduate student to expand on this and focus on finding the silver bullet equation for vegetation, landscape and cover in and around artificial roosts, so that they can construct them in optimum locations. National Wild Turkey Federation District Biologist for West Texas, Gene T. Miller, claims the number one variable affecting Rio Grande turkey populations west of Interstate 35 is the change in the vegetation over the past 40 – 50 years. The “thickening” Miller is referring to has to do with several areas that are grown up with both nonnative and native invasive species in comparison to the open grasslands that they once were. Miller suggested the largest contributor to the degradation of the native herbaceous vegetation and open grasslands of West Texas is the lack of fire on the landscape. According to Miller, the best vegetation scheme for West Texas in terms of turkey habitat should consist of 30 – 40 percent brush, with the rest composed of native herbaceous plant communities. “Landowners should knock out all the evergreens and eliminate invasive species, especially in river bottoms and other riparian zones,” he said. In addition to year-round prescribed burns, Miller advised landowners to practice rotational grazing for all livestock and to incorporate mechanical disturbance as another means to control invasive species. As whole, the Lone Star State is flush with turkeys. According to Hardin, the most recent breeding seasons were phenomenal and populations of turkeys are expanding to regions that have had low numbers for quite some time. Hardin estimated the statewide turkey population including both Easterns and Rios to be approximately 600,000 birds. He attributed these impressive statistics to diverse vegetation across the state, which in turn provides plenty of forage for the turkeys, as well a collective and collaborative effort from private landowners, TPWD, NWTF and other agencies concerned about turkey habitat. It’s springtime in Texas, and that means one thing. The struttin’ show is on. Don’t miss it!